While in Glasgow for Caffeine Magazine in April 2014, I visited Avenue Coffee on the Great Western Road, where I met a young barista named Katelyn. Back then it had recently opened, was known as Avenue G, and, upstairs on the mezzanine level, a coffee roaster was being installed: Avenue G was about to start roasting under the name “Avenue Coffee”. Realising that anything I wrote would be out-of-date before I even published it, I decided to wait until I’d had a chance to visit the roastery before writing up the Great Western Road branch. Fast-forward 18 months, the young barista had turned head-roaster, and I was finally able to accept Katelyn’s long-standing invitation to visit. You can see what I made of the Avenue Coffee Roasting Company in the Meet the Roaster series; today I’m focusing on the coffee shop part of the operation. Sitting on the corner of Barrington Drive, Avenue Coffee a lovely, sunlit spot, decked out in wood, brick and bare stone. Best described as the speciality coffee wing of Avenue G, it showcases the roastery’s output (plus guest roasters) with two options on espresso and three on filter, prepared through any of six brew methods. May 2018: Avenue Coffee is no more, with both the roastery and the coffee shop having recently closed. The original Avenue G has also undergone some changes and is now known as Turadh. Avenue Coffee has a simple, rectangular layout, short side facing onto Glasgow’s Great Western Road, long side running along Barrington Drive. There are tables outside on the pavements, with the broad pavement of the quieter Barrington Drive catching the afternoon sun, making it the better option. Generous windows line both sides, separated by thick, stone pillars. Consisting of multiple, hinged, wooden-framed panels, they can be opened, concertina-style, in good weather. Reaching about two-thirds of the way to the (very tall) ceiling, the windows are topped by large, square glass panels, which make the interior even brighter. The door is on the Great Western Road, on the far left-hand side. Inside, the layout is simple, the counter directly ahead of you, taking up the majority of the left-hand side. All the seating, with the exception of four bar-stools at a bar at the far end of the counter, is arranged around the windows. Immediately to the right of the door, running the width of Avenue Coffee, is a three-person padded bench with a pair of tables. There’s a similar padded bench and two more tables against the first set of windows on the right-hand side, followed by a high, six-person table and a normal-height four-person table. An indication of how high the ceilings are is the presence of the full-height mezzanine level, which houses the roaster. Running the full width of the back of the store, it’s reached by a flight of stairs on the right-hand side. The obvious comparison is to the original Avenue G on Byres Road, which I’d describe as serving excellent food, backed up by excellent coffee. In contrast, there’s no mistaking the coffee-first focus of the Great Western Road Branch. There is food here, all prepared to the same high standard as Byres Road, but the menu is inevitably somewhat reduced. 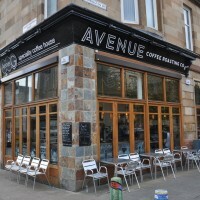 Whereas Byres Road, with its full table service, is much more akin to a restaurant, Avenue Coffee represents a traditional coffee shop. With a roaster at the back (a very Glaswegian thing). When it comes to coffee, Avenue Coffee is up there with the best of them. The mainstay is a Colombian single-origin espresso (Skyscraper Espresso). This is joined by a Brazilian St Lucia decaf and, at the weekends, by a guest espresso. I’d had the Skyscraper as a flat white at the Glasgow Coffee Festival, where I’d been impressed by its smoothness and balance. I tried it on its own and was even more impressed, the smoothness and balance joined by a sweetness that had been a little lost in milk. I also tried the decaf as a flat white, again finding it a very smooth, well-balanced coffee. A sign of Avenue Coffee’s coffee-focus is its filter coffee. Whereas Byres Road only offers Aeropress, here you can have any one of six preparation methods (Aeropress, Kalita Wave, V60, Cafetiere, Chemex and Woodneck filter). Avenue Coffee has three beans on offer, one of which is a guest (North Star during my visit). You can have these through any of the six methods, but each has been paired with two recommended methods, chosen for their contrasting extraction profiles. I tried the Ethiopian Rocko Mountain, another seriously impressive coffee, as a V60. This was bright and fruity, but still very smooth, probably the best of the lot! December 2015: Avenue Coffee was a runner-up for the 2015 Coffee Spot Awards for Best Filter Coffee and Best Roaster/Retailer. This entry was posted in Breakfast, Cafe/Roaster, Cafes, Cake, Closed, Coffee Terraces, Glasgow, Laptop Friendly, Lunch, Roastery, Sandwiches by Brian Williams. Bookmark the permalink. Hi Brian – I love your coffee spot blogs, but can I make a plea that you name the city in the first paragraph or title as I often get to the end of the blog excited to visit and then find it is hundreds of miles away! I do my best, Mike! I just gone back through the most recent 30 Coffee Spots and 25 of them mention the city in the first sentence, with three of the other five mentioning it in the opening paragraph. Of the other two, one mentions it in the second paragraph and I’ve updated the final one to include the city in the first line. If you spot any more (it’s possible that I wasn’t as consistent with the older Coffee Spots), just drop me a line in the comment box and I’ll update it. The windows and consequent suffusion of natural light really do make this Something. Or Somewhere? Quietly pleasing to see the latte art go up a notch in 2015. Not so great price mark-up. Global markets or milking coffee as a current thing? Both? And Cake Shot FINALLY becomes obligatory! 2014 had CHEESECAKE…but cake with its own jar of cream? WINNER. Probably the best serving notion for a cake/ slice I’ve seen in a while. Presumably further extending the fruit (jam) “crumble” flavour to its puddingy origins. Top stuff. Coffee presentation skills clearly extend to the food! A button is insufficient in expressing just how much I Really LIKE this one.